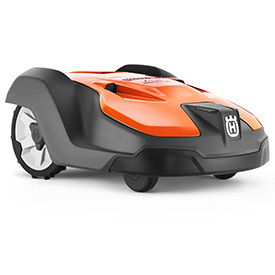 Designed for commercial landscapers, business estates, municipalities and sports clubs, Husqvarna’s first-ever professional Automower® provides an innovative solution to the challenges these operators and business owners face today. Packed with more than 20 years of proven innovation and technology, Automower® 550 offers the most modern path to business efficiency and growth, from the makers of the world’s best-selling robotic mower. Automower® produces no direct emissions, delivers the same consistent results 24/7 and can work rain or shine and even at night because it is ultra quiet. This leaves crews with more time to handle more complex tasks and frees up time to improve efficiency and productivity. Equipped with Fleet Services, Husqvarna’s cloud-based fleet management system, at no extra fee, Automower® 550 can be integrated into a full fleet solution that allows operators to monitor and control an unlimited number of robotic units. Automower® 550 can handle lawns up to 1.25 acres and slopes up to 45 percent. It is Husqvarna’s most feature-packed model and includes GPS-assisted navigation, remote object detection, control via smartphone app as well as new rubber bumper design for extra protection.